Review by AllTheBestFights.com: 2016-03-05, great start between Khalid Yafai and Dixon Flores: it gets three stars. The undefeated Khalid Yafai entered this fight with a perfect record of 17-0-0 (11 knockouts) and he is ranked as the No.11 super flyweight in the world. He fought four times last year beating Jason Cunningham in his last one (=Yafai vs Cunningham). His opponent, Dixon Flores, has a boxing record of 12-3-2 (4 knockouts) and he entered as the No.26 bantamweight. He fought four times in 2015 losing once, against Carlos Cuadras (=Cuadras vs Flores), after this bout he came back to win against Jose Perez. 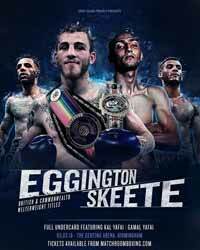 Kal Yafai vs Flores is valid for the vacant WBA Inter-Continental super flyweight title; undercard of Sam Eggington vs Bradley Skeete. Watch the video and rate this fight!